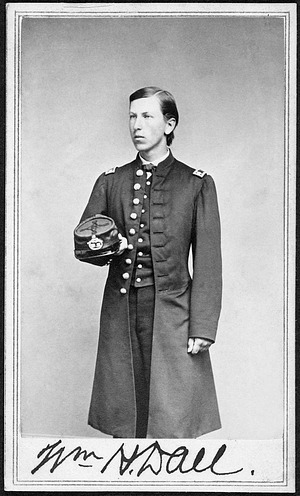 William Healey Dall was affiliated with the Smithsonian for sixty-two years, first as a scientific assistant on the 1865 Western Union Telegraph Expedition and later as Honorary Curator of Mollusks for the US National Museum. The images of the 1865 expedition staff show a stark contrast between the very young but formal Dall and his adventurous leader, Robert Kennicott. William Healey Dall (1845-1927) poses for a photo dressed in an expedition uniform. The photo is signed "Wm. H. Dall." While on the Western Union Telegraph Expedition, 1865-1868, he conducted a geological and biological survey of Alaska to determine a feasible route for a telegraph cable across the Bering Strait. July 9, 1865, by an unknown photographer, photographic print, Smithsonian Institution Archives, Record Unit 95, Box 6, Folder: 42, Negative number: SA-1156 or 2006-18833. 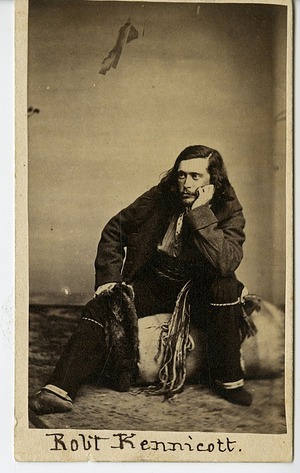 Robert Kennicott (1835-1866), explorer and naturalist, in his field clothes. Noted for his field work in Alaska, Kennicott was one of a group of young naturalists who lived in the Smithsonian Institution Building or "Castle" and dubbed themselves "The Megatherium Club." Kennicott died in Alaska on May 13, 1866, while commanding the Russian-American Telegraph Expedition, also known as the Western Union Telegraph Expedition. Photograph taken in 1865, by an unknown photographer, photographic print, Smithsonian Institution Archives, Record Unit 95, Box 25C, Folder: 37. Negative number: 43604 or MAH-43604. Engraving of men on the Western Union Telegraph Expedition, traveling up an icy river in Russian America, 1860s. An engraving of men on the Western Union Telegraph Expedition traveling up an icy river in Russia America, what is now called Alaska. Obsidian from the beach of Norwikakat River, Alaska, by the Western Union Telegraph Expedition to Alaska, 1865-1866. William H. Dall, curator of echinoderms for the United States National Museum, now known as the National Museum of Natural History, is sitting at a desk that has two books on it. 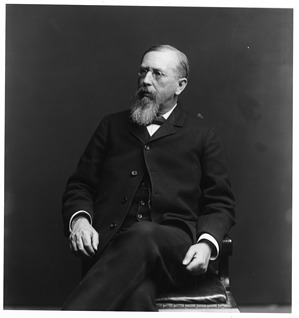 Dean of Alaskan explorations, William Healey Dall , 1845-1927, began his scientific career as a member of the Scientific Corps of the Alaskan Western Union Telegraph Expedition in 1865. In 1871 he was appointed to the United States Coast Survey, where he continued his studies on Alaska and the northern Pacific Coast. Dall left the Coast Survey in 1884 to accept the rank of Paleontologist with the United States Geological Survey, a position he held until 1925. C. 1900, by an unknown photographer, photographic print, Smithsonian Institution Archives, Record Unit 95, Box 6, Folder: 42, Negative number: SIA2009-4239 or 14535. 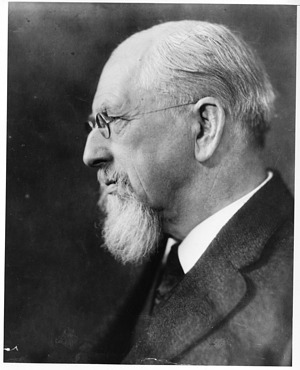 Image is of William H. Dall, curator of echinoderms for the United States National Museum, now known as the National Museum of Natural History. 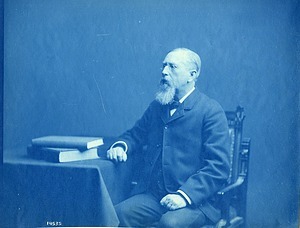 Dall is sitting in a chair looking off to his right, c. 1910, by an unknown photographer, photographic print, Smithsonian Institution Archives, Record Unit 9526, Box 1, Negative number: SIA2009-4237 or MAH-14538. 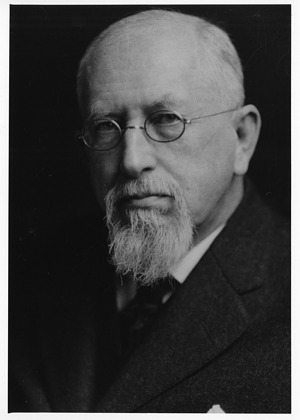 Image of William H. Dall, curator of echinoderms for the United States National Museum (now known as the National Museum of Natural History), shows Dall's profile looking to the left, c. 1916, by an unknown photographer, photographic print, Smithsonian Institution Archives, Record Unit 95, Box 6, Folder: 42, Negative number: SIA2009-4238 or 44073. Image is of William H. Dall, curator of echinoderms for the United States National Museum, now known as the National Museum of Natural History, by an unknown photographer, photographic print, Smithsonian Institution Archives, Record Unit 95, Box 6, Folder: 42, Negative number: SIA2009-4236 or SA 1152.